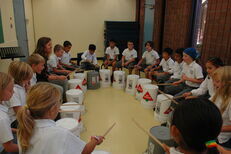 We are very proud of our music program and the enthusiasm that it instils in our students. Westboro Academy’s popular music program is taught by a certified Music Specialist Teacher. It is part of the program for all students from Junior Kindergarten through grade 8. The focus of the program is on developing a love for a variety of forms of music, participation, and developing an understanding of the basic concepts in music. 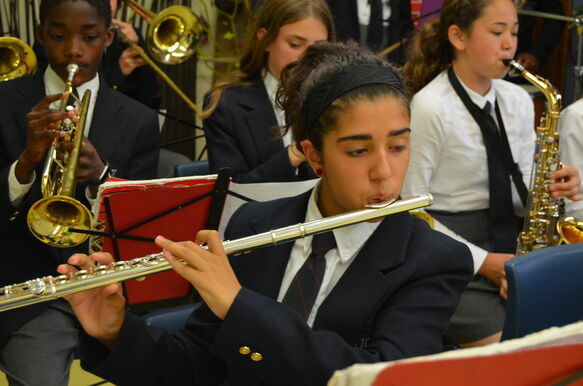 Our Music Program has many aspects including: formal music classes for all grades, optional choir and instrumental music for grades 6-8 including flutes, clarinets, alto saxophones, and tenor saxophones, trombone, and trumpet. In this way, every student is able to find a musical and creative outlet and develop a greater appreciation for music. Twice a year, the students prepare a show for parents and guests that highlight and exhibit the pieces they have mastered. Our students have demonstrated some fine talent! Westboro Academy prides itself on making art meaningful, enjoyable and accessible to all students. We offer a hands on learning process that nurtures creativity and self-expression. Our visual arts program is designed to inspire critical thinking, creative problem solving skills, as well as using art to enhance learning in other disciplines. In kindergarten, the students integrate art projects into their thematic learning within their homeroom environment. Art at this level encourages self-expression and creativity as well as enhances fine motor skills and coordination. In grades 1-5, the imaginative process is encouraged by providing activities with no “right” or “wrong” design. However, the lessons and projects are chosen with specific principles and objectives in mind. Students start with an idea and are then introduced to new techniques through a multi-media approach. This program is designed to help foster an appreciation for the arts. In grades 6-8, students use traditional & contemporary tools, materials and media to express feelings, think like artists and value the creative process and the art form.